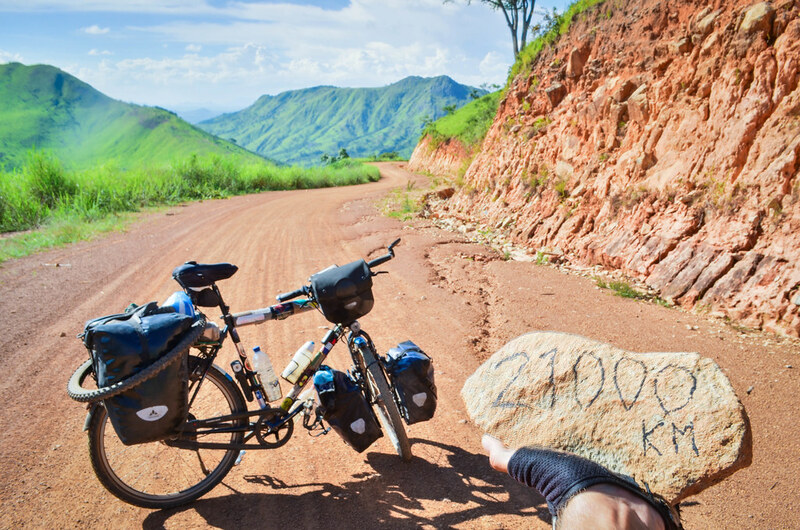 That is more than half a round the world journey (Earth’s circumference at the Equator: 40075 km) and, still riding the least frequented dirt roads when possible, my equipment is falling apart one item at a time. Now above 1500m high, on the way to Lubango, Angola is a camping paradise: endless green landscapes, few villages, blue sky during the day and a myriad of stars at night. It’s also because I barely have the choice to stay in cities, where crappy rooms without bathroom start at 50 USD. The policemen are controlling me and making reports every time I am unlucky enough to cycle near one of them, and the locals are scared and curious more than anywhere else. Often, kids and a good number of adults will run away and hide in bushes when they see me on the road, sometimes screaming and dropping what they were carrying on their head. Motorbikers will make a U-turn when they pass me so that they can see “the Chinese” twice more from closer. I have never been that much called “Chinese” and observed like an UFO.